First my friend Khrys over at Keepin it Kool in Kinderland is almost to 100 followers so she is gearing up for a great giveaway! I have donated my newest Winter Math Centers for Addition and Subtraction and she has lots of other great stuff ready for her giveaway. Head on over and check out her super cute blog! The sooner she hits 100 followers the sooner we'll get to the giveaway! Then I found this great new blog called Blooming in First Grade! She is giving away a super cute Valentine's Day graphics set! Head on over and check it out but hurry you have to enter by Monday night! I really hope I win this one! OK that is it for tonight I really HAVE to get to work on those report cards! Your math centers look great! Oh my goodness Sarah! I just reached 100! Eeeek! Thanks so much for the shout out and for donating to my giveaway! Get ready, it's going to be fantastic! I need to get to work as well! I did all my assessments, now it's just translating that to the 13 page "progress report"... yikes! :) So excited that you're donating too, your centers look great! 13 pages yikes!!! Good luck! As you can see I am still not working on those report cards! Arghh time to step away from the blogs and get to work! Glad I am not the only that puts off report cards. 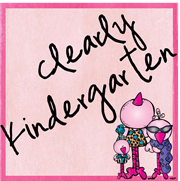 I found your cute blog via Learning with Mrs. Leeby and glad I did. I am also having my first little Lovely Giveaway as well. I don't know about great, but thanks for mentioning my little giveaway on your blog! I am not the only one who puts of report cards too. I wish they would just write themselves!